Nigeria’s Boko Haram militants are believed to have carried out a mass kidnapping across the border in Cameroon, just two weeks after they made international headlines for ravaging the town of Baga. As many as 80 people were kidnapped in the group’s largest foreign abduction to date, though Cameroonian forces appear to have later freed some of the captives. Nigeria, home to one of Africa’s most bustling economies, sits on the Gulf of Guinea, on the continent’s western coast. It shares significant land borders with Benin, Niger, and Cameroon — including along its militant-ravaged northeast. The weekend’s attack took place in the villages of Cameroon’s Far North. The area lies a bit over a three-hour drive east of the Nigerian town of Chibok, best known for the hundreds of schoolgirls abducted there by Boko Haram militants in April of last year. 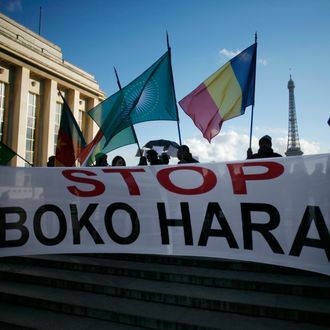 Why Isn’t There Better Coverage of Boko Haram’s Huge Attack in Nigeria? Not that this minor setback is slowing militants down. While some of Boko Haram’s terrorists were raiding Cameroonian villages Sunday, Nigeria suffered another suicide bombing in the north. While Boko Haram hasn’t yet claimed ownership of this latest attack, it’s well known for using similar tactics in the past. The group’s other departments, meanwhile, are attacking neighboring military bases, attacks that prompted Chad — whose only border with Nigeria lies over its eponymous lake — to send military backup to Cameroon. And yet the only one who seems utterly unconcerned with his country’s radical Islamist insurgency is Nigerian leader Goodluck Jonathan, who’s busy focusing on the positives ahead of his upcoming election. Jonathan is notorious for downplaying the extent of Boko Haram attacks — including the one in Chibok — and took a long time to speak out about the tragedy in Baga. Good luck dealing with all that after your reelection, Jonathan.